Help spread the word, far and wide. You can get some FREE, CT90-CT110 Promotion Cards. If you will send me an email with your mailing address, I'll return to you an envelope with some CT90-CT110 Promotion Cards. When you're out riding your CT and someone stops you and they ask you about your "ride", you can hand them a CT90-CT110 Promotion Card. 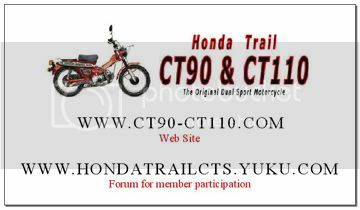 You can give them out to friends, post them at various bulletin boards in motorcycle shops, restaurants, outhouses (just kidding), you get the picture... (just make sure it's OK to put the CT90-CT110 Promotion Card there... probably no permanent public places, like stop signs, road signs, etc... now you get the full picture? We don't want to litter or get anyone, like me, in trouble, do we?). 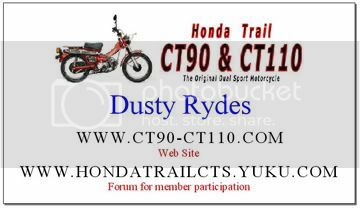 Take a photo of who you hand them to (holding the card, of course) or where you put them, and post the photo(s) in a new message over on the Honda Trail CT90-CT110 forum in the "Promote the Forum and Web Site" section. Let's see some photos of people holding the CT90-CT110 Promotion Cards or the places you put them. If you have a GPS, you could give the location coordinates for others to find (someday). Or, you can get some of both, the general one for putting on bulletin boards and the customized one for handing out to friends. I promise to NOT use your mailing address for any other purpose. If you run out of CT90-CT110 Promotion Cards, just send me another email and more of them will be mailed to you.